Dialysis patient and author Jurgen Hesse says, Poignant Moments…A Caregiver’s Perspective “. . . is the kind of moving story that cannot be told enough times.” Many people unfortunately do not understand dialysis, but all know that we have kidneys. An interview with author John Francis Wissler on Home Dialysis Central Lois & John Lois was born with only one working kidney. So, she was more than a little concerned when she developed stones in her "good" kidney. The kidney stones were painful, and Lois spent 3 weeks in a Massachusetts hospital getting treatment to break up the stones and pass them from her system. The experience was the beginning of a new phase for Lois and John (her significant other)...a phase that would involve both of them in learning about and living with chronic kidney disease. A learning processAfter her kidney stone episode, Lois began to see a nephrologist ("Who even knew what a nephrologist was?" laughed John. "We even had to learn that.") for regular check-ups. And, both Lois and John began to search for information about kidney stones, kidney disease and living with chronic illness. "Educating yourself is paramount," said John, "if you don't know what's going on you'll be stuck." At first John and Lois looked up information about the best diet for people with kidney stones. They quickly moved on to learning about the stones themselves, the tests and the treatments. Because they knew that Lois' remaining kidney was likely to fail, they also learned about chronic kidney disease, kidney failure and dialysis. Next, came financial research. How were they going to pay for Lois' medical care? What did it take to qualify for Medicare coverage that would help pay the cost of dialysis? Even though they didn't have a computer at that time, Lois and John used other resources. "We'd go to the library or ask friends and family for help," remembered John. "Eventually we got our own computer. It's a great way to get information. Now I just Google everything." Starting dialysisLois' kidney function continued to deteriorate, and 6 years after her kidney stone episode, her doctor told her it was time to start dialysis. And she did start—like most people do—with in-center hemodialysis. "Lois never liked in-center hemo," remembered John. "Whenever she was there, all she could think about was how sick she was." Lois and John were so unhappy that they changed dialysis centers to see if things might be better someplace else. When a nurse at the new unit asked if anyone was interested in learning about peritoneal dialysis (PD), they jumped at the chance. She and John trained to do PD and happily went home. "PD was fabulous," recalled John. "We started doing manual exchanges and then moved to a cycler. Lois loved the fact that she didn't have to go to the dialysis center anymore." Unfortunately, a severe case of peritonitis ended Lois' ability to do PD, and when the infection cleared up, she went back to in-center hemo. Discovering the home hemo optionMeanwhile, John was talking to people with chronic kidney disease online...in chat groups and on discussion boards. Through these people, he learned that it was possible to do hemodialysis at home. "Things were changing and coming full circle from the sixties, when dialysis all began." he said. John started to look into home hemodialysis as an option for Lois. "I knew she wasn't going to last much longer in-center," he said. "She disliked it so much she would always want to come off early, and that's not good for you. Those 15 and 20 minutes add up over time. We learned about patient and caregiver control and that yes hemodialysis can be done at home. With willingness, desire and the thought of a better quality of life (QOL) we realized, 'there's no choice!!'" John and Lois liked the idea of home hemodialysis, but they were afraid that Lois had too many medical complications to qualify. After much discussion, Lois told the head nurse at her dialysis unit that she was interested in doing dialysis at home. She got a referral to the home training nurse. "We met with the nurse, with the dietitian, the social worker, and the doctor to talk about home dialysis," said John. "We were surprised, but Dr Lauer (Allan Lauer, MD) gave us the OK." Getting readyJohn had some doubts. "I sat on a bench outside the dialysis unit and thought about it long and hard," he recalled. "What was I getting myself into? Could I handle the responsibility?" Encouragement from the home dialysis staff at Taunton Kidney Center (Taunton, MA) and the belief that home dialysis would be better for Lois helped John make the decision to go ahead. Lois and John began training for home dialysis in September 2000. They went to training sessions 3 times a week on the same days Lois had her dialysis treatments. Sometimes, John went into the unit for extra training on Lois' days off. "I was afraid of the training," John said, "but it was not as tough as I thought it would be. It was actually easy." After 3 months (with a few breaks due to scheduling) John and Lois passed the test—they had the knowledge they needed to do dialysis at home. Home at lastNow, he's glad that he did. "Things couldn't have been better once we got Lois home," said John. "She could sit or lay in her own bed; she didn't have to be in one of those recliners." Because Lois was more comfortable at home, she was able—and willing—to dialyze for longer periods of time. "We did dialysis 3 times a week for 4 1/2 hours," John reported, "and our goal was to get to 5 hours quickly." Lois' lab values improved greatly and she began to feel better. Gradually, she was able to relax her dietary restrictions, too. "Her labs were so good she got to eat her first baked potato in 5 years," noted John. Lois used a Fresenius 2008H dialysis machine at home, and John handled the equipment set-up and tear down. "After awhile, I could set everything up in about an hour," he said. Help and technical advice from the dialysis staff was as near as the phone, but John rarely needed to call. "I tell everyone not to be afraid of the machines," he commented. "They may look scary, but they have so many safeguards and failsafe mechanisms with more bells and whistles than the average police car, that things hardly ever go wrong." Things went well for several months, but then Lois' hematocrit levels began to drop. She needed a blood transfusion and tests to find out what was wrong, but Lois didn't want to go to the hospital. Low hematocrit levels contributed to her becoming tired and lethargic. When she began to have breathing problems, her caregiver urged her to seek medical attention-which she did. She was admitted to the hospital with a "small amount of pneumonia." In spite of medical care, 6 days later Lois died. "Everything—all her medical problems—just caught up with her," explained John. Encouraging othersJohn remains a vocal and written advocate for home dialysis. "Home dialysis was the best thing—mentally and physically—for Lois," John declared. "I just wish more people were aware that it is an option. You don't need to be formally educated. Lois was and I, as a caregiver, was not. Willingness, desire, and motivation are important features. This can be done, yet our United States government needs to be educated." For that reason, and to encourage others who are living with kidney failure or caring for someone with kidney failure, John has written a book about his experiences with Lois and her struggle with kidney disease. He hopes the story will give others in similar situations the courage to learn about—and even try—home dialysis. John tells the sometimes heart-rending, touching story of their struggle to improve the quality of Lois' life....the challenges presented by the various systems they encountered, the moments of pain, joy, and humor. Lois died in March 2001 of heart failure linked to chronic kidney disease. John, her loving companion for years, tells the story of Lois' life (a strong, feisty, irascible, lovable person) with kidney disease, her successes with home dialysis...and his role as her caregiver in a personal memoir, written as a nonfiction novel entitled, Poignant Moments . . . A Caregiver's Perspective. The self-published book by BOOKSURGE, LLC (an Amazon.com company) is available via John's own website at http://poignantmoments.tripod.com or Amazon.com. 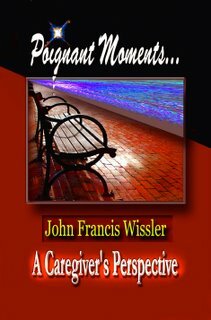 Dialysis patient and author Jurgen Hesse says, Poignant Moments…A Caregiver’s Perspective “. . . is the kind of moving story that cannot be told enough times.” Many people unfortunately do not understand dialysis, but all know that we have kidneys. However, author John Francis Wissler will wager that almost everyone knows someone who gives care for a friend, mother, or father; a grandfather; a grandmother…a son, daughter…or a spouse and home hemodialysis patient. In the United States alone, caregiver value accounts for $265 billion per year. In this book a story is told of the skills, patience and stresses of one out of fifty million caregivers. Wissler takes the reader on a tortuous journey of him as caregiver, and his significant other, Lois, as care receiver, with all the bumps and laughs in the road along the way. No less important is the bureaucratic wrangling as the author relentlessly seeks the appropriate level of medical care for a woman in increasingly dire straits. Poignant Moments…is a compelling human-interest, educational, nonfiction novel that leading nephrologist, Professor John Agar, MBBS, FRACP in Australia says, “I am brought back to earth with a jolt. You have dealt with horror yet how well you have softened its edges with humour and empathy.” Price: $19.95 a copy (plus shipping and handling) To order this book, please visit http://PoignantMoments.tripod.com/id12.html or www.amazon.com. 332 pgs.